How to get to Treblinka? 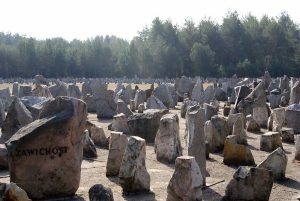 17 thousand stones of varying sizes symbolize matzevot- Jewish headstones- commemorates the 900 000 victims of the Holocaust whose final resting place is Treblinka. 216 of the stones bear the names of the cities and towns from which Jews were transported here. The Treblinka death camp was established as part of Operation Reinhard, the goal of which was to eliminate the Jewish population. It was located in a secluded area, 4 kilometers away from the Treblinka train station, between Warsaw and Białystok. A penal camp for the Polish population, called “Treblinka I” already operated in the Kosów municipality (gmina) in the Sokołów county (powiat) in 1940. A year later it was transformed into a labor camp. The area right next to “Treblinka I” was chosen for the mass extermination of Jewish men, women and children and the newly established death camp was called “Treblinka II”. Work on its creation began between May and June 1942. It covered 20 hectares and was surrounded by a high barbed wire fence, threaded through with pine branches, to hide what was happening beyond the wire. The camp was operated by a command staff of 30-40 Germans and Austrians who were assisted by around 100-120 guards, mainly Ukrainians. Psychiatrist Irmfried Eberl became the first commandant of the camp, later followed by Franz Stangl. Kurt Franz was the deputy commandant. The first transport of prisoners arrived on the 23rd of July 1942, bringing Jews from the Warsaw ghetto. Jews were brought here mainly from the General Governorate, but also Białystok, the Theresienstadt ghetto and other ghettos in Czechoslovakia, Greece, Bulgaria, Yugoslavia, the USSR, as well as Germany and Austria. Romani and Sinti people from Poland and Germany were also brought here. The prisoners were gassed with exhaust fumes in gas chambers built specifically for that purpose. Around 900 000 people are estimated to have died here. To cover up these war crimes, the bodies were cremated on grates made of rails. On the 2nd of August 1943, an armed uprising broke out in the camp. As of the moment when the revolt began, there were 840 Jews in the Treblinka II camp. 400 prisoners managed to escape, 70 survived the war. After the uprising, the camp was slowly shut down. In November 1943 the camp’s structures were dismantled. A farmhouse was built for a Ukrainian family; the ground was ploughed and planted with lupine. The buildings were burned down when the approach of the eastern front became imminent. In 1964 the Museum of Struggle and Martyrdom in Treblinka was established. The monument designed by Adam Haupt, Franciszek Duszenko and Ftanciszek Strynkiewicz consist of three parts: a symbolic gate to the camp, from which a path, at the edge of the forest, leads towards the ramp where the wagons of victims were unloaded, parallel to the path run train tracks laid out with concrete blocks. Near the ramp, on the right side of the path leading to the gas chambers, stand stones engraved with the names of the countries from which Jews were brought to Treblinka. In the center of the field near the ramp, a monument was erected using granite blocks, whose placement refers to the Wall of Tears in Jerusalem. Beyond the monument, lies the area where bodies were cremated, commemorated with a rectangle of melted black basalt. The third element consists of 17 thousand stones of varying sizes. Audio guide "Extermination camp Treblinka II"